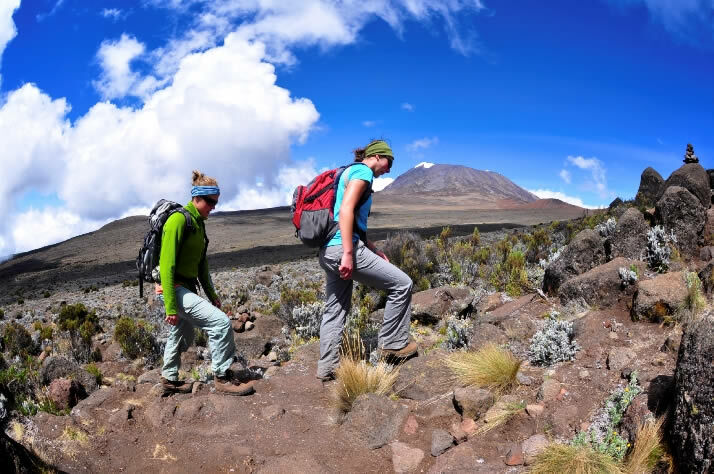 Also known as the Coca Cola route is the easiest to climb mount Kilimanjaro and commonly used, an easy walk as far as the Kibo Hut. The lower sections provide fine forest and moorland walking. The lunar landscape of the Saddle leads to the Kibo Hut;. All huts on the route are manned and in radio contact with the Park Headquarters at Marangu. Just above the Park Gate the western route through the forest provides a longer, more difficult but beautiful walk along narrow paths beside streams. The drive from Moshi to the Kilimanjaro National Park gate, takes about 50 minutes. The journey passes through the village of Marangu, which is located on the lower slopes of the mountain. Once you reach the park gate, all hikers are requested to sign in at the Park office and make their final preparations for the climb. Porters will be seen arranging and loading their packs, containing the food, water, cooking gas as well as most of your equipment. Make sure that you have all your daypack items (containing at least drinking water, your lunch pack and extra clothing) with you as the porters ascend a lot quicker than the hikers. Our guides will be available to assist with any additional information or needs you might have. You now leave the Park gate and ascend on a cleared ridge trail through the rain forest. The forest, suffused with mist and dripping with beards of moss, is also where most of Kilimanjaro’s animals are found. (An alternative and more scenic parallel forest trail, branches off the to the left a few minutes after the gate. From Mandara hut the trail passes through a short stretch of forest, then skirts the base of the Maundi Crater and then emerges into the transition from rain forest to moorland. It is well worth a short detour to scramble up the rim of the Maundi Crater for your first really impressive view of the Kibo Crater. On a clear day, Kibo will glimmer in the distance, showing off her majestic glaciers in the morning sun. Once you are in the open moorland you will get the chance to see some of Kilimanjaro’s most spectacular plants – the endemic giant lobelia which grows up to 3 m in height and the giant groundsel (Senecia Kilimanjari), which can reach heights of 5m! After about 6 hours from here you reach the Horombo hut, where you will have hot washing water, rest; an evening meal and overnight. Kilimanjaro Hikers. After breakfast you now continue your ascent into the Alpine desert habitat. From Horombo there are two trails to the “Saddle” (which refers to the area located between the peaks of Mawenzi and Kibo). There is an upper route (right hand fork) and lower route (left hand fork) to choose from. The upper route (right hand fork) will be very familiar, as you will have climbed most of it the previous day towards Mawenzi hut. It is very stony and eroded. The recommended lower route (left hand fork) is much easier and nearly an hour, and it also passes the last watering point at 4130m. You will have to fill your water bottles with all the water you will need until your return to Horombo hut in two night’s time (unless you are willing to buy Mineral water at Kibo hut). Once again remember to slow down and drink enough water!! Situated in the barren Alpine desert is Horombo hut, a stone build block house which has bunk beds for 60 climbers, but no streams with water nearby. It is however possible to buy mineral water and soft drinks at the camp office. There are platform toilets behind the hut. The summit is now a further 1195m up and you will make your Sleeping hikers at Kibo hut.final ascent the same night. Prepare your equipment, ski-stick and thermal clothing for your summit bid. This should include the replacement of your headlamp and camera batteries and make sure you have a spare set available as well. To prevent freezing it will be wise to carry your water in a thermal flask. Go to bed at round about 19h00 and try to get as much rest and sleep as possible. You will rise around 23h30, and after some tea and biscuits you shuffle off into the night, and this is where the going really gets tough. The first section of the On the Summit. trail consists of a rocky path to the Hans Meyer Cave (5150m), also a good resting spot. The path then zigzags up to Gillman’s point (5 681m), which is located on the crater rim. This section is very steep with a lot of stone scree, requiring a great physical and mental effort. Probably the most demanding section of the entire route. Do the Kili shuffle and move slowly. Group at Gilmans Point. From Gillmans Point you will normally encounter snow all the way up to Uhuru peak (5895m), the highest point in Africa. Total exhilaration and satisfaction – you made it. Weather conditions on the summit will determine how long you will be able to spend, taking photographs, before the 3 hour descent back to Kibo hut. At Marangu gate you sign your name and details in a register. This is also where successful climbers receive their summit certificates. Those climbers who reached Gillman’s Point (5685m) are issued with green certificates and those who reached Uhuru Peak (5895m), receive gold certificates. You now drive back to Moshi for a long over due hot shower, dinner and celebrations!! Overnight in Spring lands hotel bed/breakfast.